So, once you have decided a Cape Cutter is for you, you get the standard spec and then you look at the options. So, where do you start with the extras from the factory and what else do you need? Well how you want to use the boat is the first question. If trailer sailed you obviously need the excellent HM trailer, but if only day/dry sailed then you might get away without antifoul. However most people opt for the trailer and antifoul. Drift has a trailer with spare wheel and the essential rear jockey wheel which allows you to jump on and off the boat safely when not attached to a vehicle. We also went for coppercoat, which easily pays for itself over time and the thought of not having the annual winter antifoul session made it a no brainer. That said not sure if its legal in all countries. The overall cover is good for over winter storage, but its better to trail without it. Sails – traditional tan or cream? Take your pick they cost the same. One potential advantage of the cream sails is you can see tell tales through them a little easier, if thats your thing, but tan are more traditional. Drift has cream sails from Hydes. You will want a sacrificial strip on the headsail if you plan to leave it furled on the bowsprit. The genoa is standard, but the Yankee staysail combo works better to windward and tacks easily. It would appear that people who buy the Yankee afterwards, then hardly ever use the Genoa, so have the Yankee instead of the Genoa – looks better as well. If you need a bit more poke down wind Hydes will make you a very nice Gennaker albeit its not an official HM item and you have to go direct – see below. Furler for the Staysail as well? Arguments each way for this. 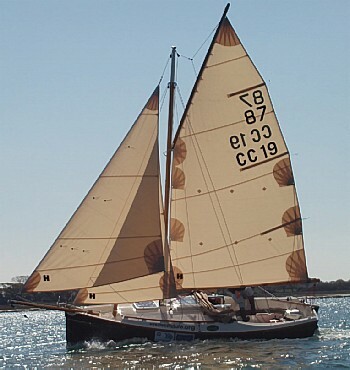 The hank on ‘ers argue that the boat points better when the staysail is hanked on and there may be some truth in that. However furling makes the boat very quick to reduce all sails and is potentially more user friendly. Also if you pre tension the halyards before each sail and they have a proper torsion line system (extra, but ask Bob to get them added when he orders the sails), you shouldn’t see much more sag than if hanked on. When I asked Mike B about this, he looked at me and made the comment that gaffers are never going to be that close winded so it would have little effect ! Given that he sailed round Britain and won his class in two Round the Island Races – with a furling staysail, it can’t be bad…. He does however drop both sails rolled when he leaves the boat for any period of time and that will certainly extend the life of the sails. I have gone for Karver furlers on both – pricy, but they should never jam. That said any decent furler will work and if you do have a furler on the staysail then you may want an additional sacrificial strip. If you stick with single line furlers, then the supplied spinlocks will work the furling line. Unfortunately, continuous furlers like the Karvers need two lines. HM like to fit these running down the extreme port side of the boat into some spinlock jammers ( See the blog http://www.yachtdrift.wordpress.com/2013/10/30/furler-fixing/ ). This will obviously work, but I wasn’t keen on this for two reasons. 1) I suspect that every time you need to get at them someone would be sitting in front of them; and 2) to operate them you are leaning weight onto one side of the boat, half kneeling and pulling lines going in opposite directions, through single eyes. Control lines are best if accessed centrally, with minimum friction and operated when standing, so ours come back to simple cleats, one either side of the companionway (again a tip from Mike B). The spare spinlocks and eyes then become a whisper pole downhauls. Electrics – two fields of thought here. Either none at all and keep it simple, or wack them in. I think that if you intend to sleep on board, then having a battery, Nav Lights, internal LED Lights and a way to charge your phone is very useful and makes life easier. We are also fitting a one box instrument, the excellent EchoMap 50s from Garmin, which can be a plotter, but can also be set up to just show speed and depth. A transducer will be fitted in a tube, so no hull holes and it works out cheaper than fitting a number of instruments for speed and depth – oh and you get a plotter for free! We have also had supplied by HM a Hawk windex for the top of the mast giving us a wind indicator and an aerial for the VHF. Obviously the electrics for the VHF and lights have to come down through the mast and need deck plugs so they can be disconnected when trailing. There are various ways of fitting instruments. HM now supply 2/3rd with Halyard bags as standard, so there is space for conventional instruments either side of the companionway. As we are using a one box instrument, we are probably mounting it on a swing out board. The VHF will be screwed up into the coachroof to the one side of the hatch at an angle. Accessible from the cockpit, but out of the way. Nasa now do a clever masthead LED light which is a tricolour and then flicks to an anchor light. You may also consider a tiller pilot if you plan to sail solo a great deal. Teak – if you must. HM do a good job of fitting it in the cockpit, but to me I’d rather save on the maintenance and cost. I did however have flexteek panels on the cabin sole – just seems to warm it up a bit. Perhaps because of the design or the additional weight of the 4 stroke engines, water can come into the cockpit, so a teak grating may be needed if you are not wearing sea boots all of the time. HM supply a nice one, but its pricey, so some people make their own. There is a company called KJ Howells in Poole ( http://www.kjhowells.com/teak_grating_kits ) who supply an adjustable ‘kit’. One thing to note is that the cockpit floor has a convex curve to it for strength, so any traditional grating will need a couple of runners on either side so the grate clears the centre of the floor. Outboard – We have stuck with a 4 stroke Petrol although did think about electric. Most 4-5-6’s are the same size and weight at the different powers, in their respective ranges. I have heard about a few problems with the well location not suiting the Honda and personally I never particularly liked that engine on a previous boat, but I understand that Yamaha, Mercury, Suzuki, Mariner, Tohatsu all fit . Sprayhood – I have never had a spray hood on a boat and if it wasn’t for trying to make the boat as user friendly as possible for my better half I probably wouldn’t have done so. However, having sailed on Mike Brookes boat he had a fabulous one and it sold it to me because it has an excellent cockpit tent which zips on to it and gives huge amounts of space for overnighting. Both people who I know have had these raved about them. they are made in Portsmouth by TecSew. 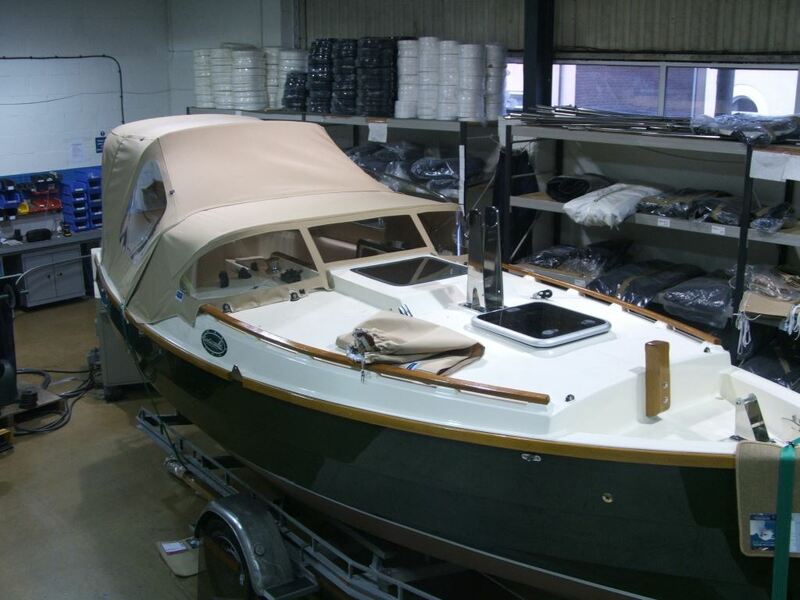 Here are pictures of Mike’s boat when it was being fitted. If you do have a spray hood fitted, you will need an extra couple of deck eyes to lead the Yankee sheet forward from the spinlock to clear the font of the spray hood. This sheeting angle is fine with the yankee, but if using the genoa and you want a decent sheeting angle you will need to drop the sprayhood when sailing and take it direct to the spinlock. HM can supply a nice small Lagun mount teak table which slots on one side of the centreboard case. A further extra is to have a duplicate fitting in the cockpit – nice place to sit with a cup of tea! We have done this, but probably wouldn’t if I was sailing on my own. Anchor – Most people seem happy with the HM anchor, its a home made copy of a modern self setting design. It and the bow roller are essential, but on the option list. You will also need to budget for some chain and anchor rode and something to hold them in. Ensign Holder – again HM can supply a stainless steel one that screws on to the aft of the tiller. Stainless Chafe plates – may be useful on the bow if your mooring is on a buoy. Usual boat inventory on top such as fenders, warps, ensign and flagstaff, chemi loo for the other half and a £20 camping cartridge stove, kettle, cups, lifejackets and other associated safety equipment etc. Do remember when buying fenders that the cockpit lockers are small and most of one will probably house a fuel tank and warps!